Beware of Stingers: There are many different types of Jellyfish and other stinging sea creatures. Always ask the locals about any local dangerous creatures you should be aware of. In some places, swimming is totally inadvisable, and other areas where the wearing of “stinger suits” is considered mandatory. Jellyfish are often associated with rains, tides and lunar cycles. For example; In Hawaii, Jellyfish frequently occur 10 days after full moon. 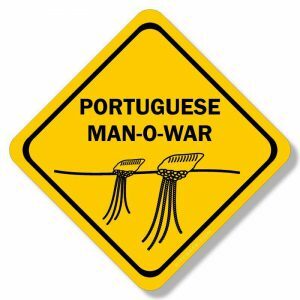 During extended periods of onshore winds, it is possible to get “Portuguese man-o-war (bluebottles)”. Portuguese man-o-wars are wind-driven and have little air sacs that help they stay at the surface and also act as sails to help them travel across the water. They can sometimes appear individually or en masse. These stinging creatures can be painful and are usually painful, but can be dangerous to sensitive individuals. It is always prudent to avoid contact with any form of stingers. Avoid sailing at times of high frequency, and/or cover up as much of your skin as possible. Wear tight clothing like lycra shirts and pants, as they are good protection from stings. Even booties and gloves can help as well. Baggy clothing is not as effective against stingers. 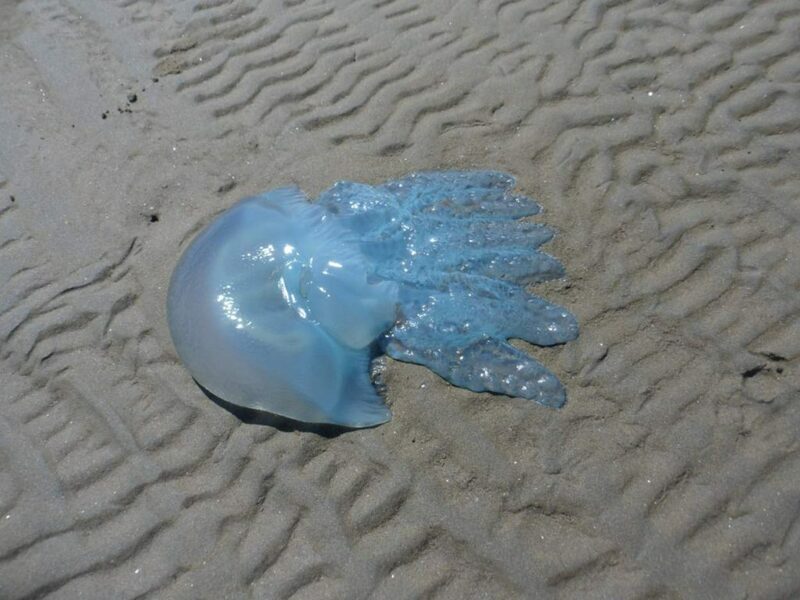 Man-o-war can still sting after they are washed ashore so be aware and avoid them. You should consider having first aid kite close at hand when kiting, that includes vinegar and other medically recommended (safe) sting treatments. When you are stung get treatment from the lifeguard or first-aid person. If you experience a severe allergic reaction and/or have any trouble breathing, get medical assistance asap.